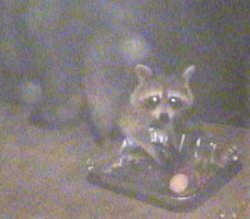 A raccoon enjoying dinner on our porch, 10/12/01. Other mammals not covered include weasels, otters, nutria, etc. that will also eat at a pond. Only a rare cat will get into your pond but they will often fish by the edge. If the water is far enough below the rim, they cannot catch anything. None of my cats have ever shown interest in the fish; they do not even acknowledge there is anything there. My ponds have a drop from the edge down to the water which would make it very hard for a cat to even touch a fish without falling in. My outdoor cat has fallen in the pond a few times while walking around the edge. I have never seen a cat move so fast! She wanted out of there. She walks all over the steep and wet waterfall and only drinks water from there. If cats do fish by your pond and in any case, provide lots of plants and things in which fish can hide. If the cat who is fishing in your pond is yours, make the cat an indoor cat. If the cat is the neighbor's, urge them to keep the cat indoors. Feral and stray cats can be trapped. Stray cats can be adopted. I am a cat lover so I do not advocate any methods that harm cats. For information on managing feral cats, see http://www.alleycat.org. My page on my pet cats is here. Beavers are pond creators just like you! They usually will create a pond along a small moving stream. Beavers are highly intelligent and social. If they do move into an ornamental pond (which I have not heard of), they can eat lily and lotus tubers. They eat mostly trees if available. 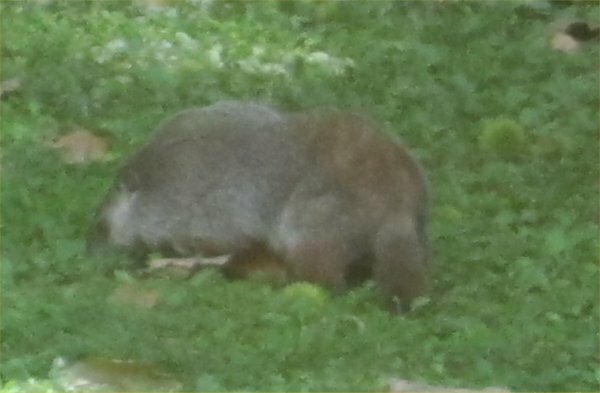 A problem beaver should be relocated. 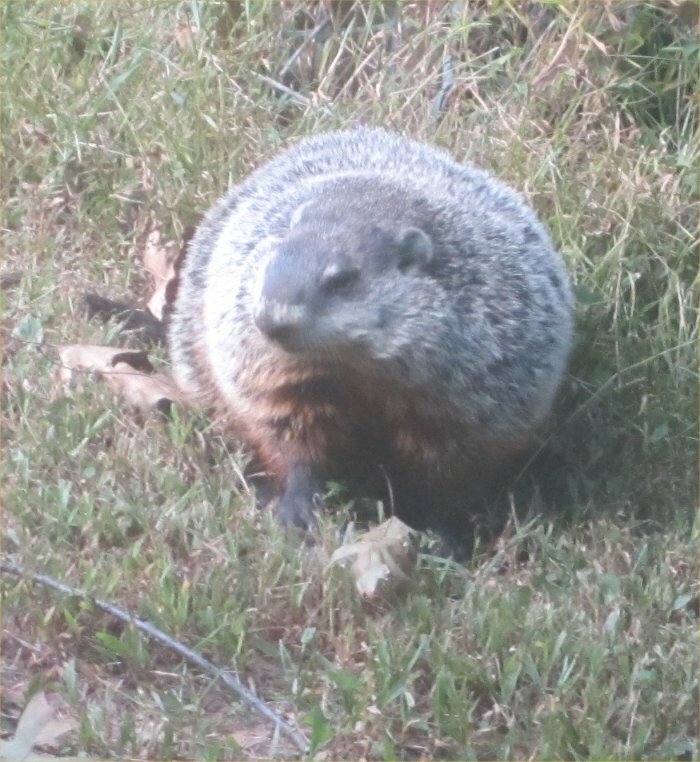 Most local wildlife agencies will take care of this. Water loving dogs may jump into ponds, messing up plants and popping holes in the liner. If a neighbor refuses to contain his dog (which is the law in most areas) or your pooch just will not listen, you will have to fence in the pond. Some ponders have dogs that will eat their fish too. Foxes behave like dogs but are more likely to eat fish and less likely to go for a swim. On the plus side, dogs are often used around large ponds to scare off predators including great blue herons and raccoons. They will also scare off cats, people, deer, etc. My page on my pet dogs is here. 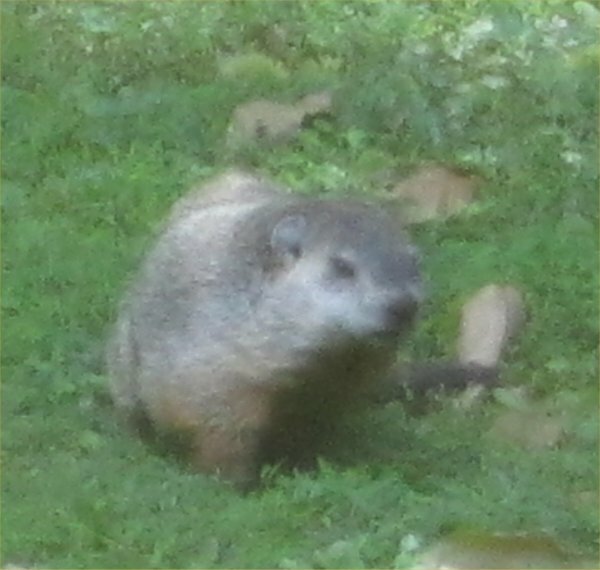 While we have lived at our home since 1977, it was not until after 2000 that we began to see an occasional groundhog. 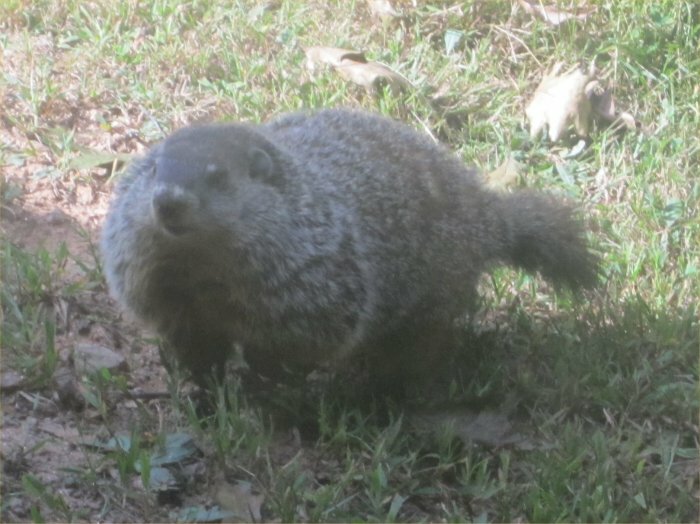 In 2014, one decided to dig under my back porch. I got these photos on 9/20/14. 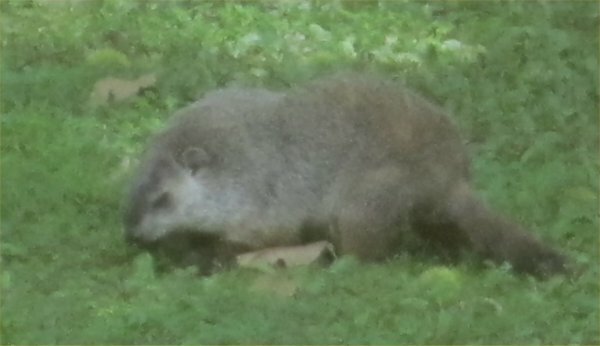 So, I named our groundhog Chewbacca because he/she likes to eat plastic including the tarp on the generator, plastic bags over pea gravel, and plastic bags over mulch. Chewbacca left a trail of plastic destruction! 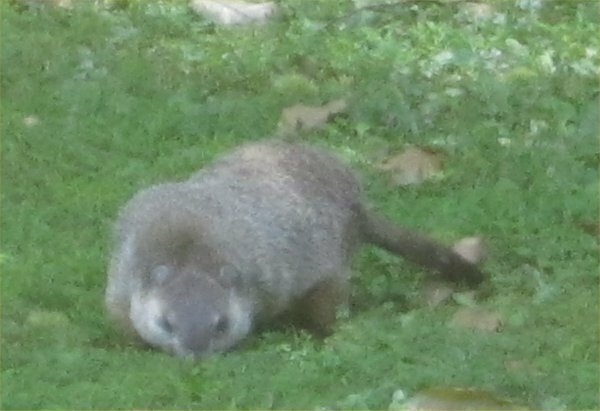 Chewbacca lives under the porch, going in at three separate locations, and also spends time under the shed. Here are photos of Chewbacca. Yes, I said humans. Hopefully, most visitors are invited or harmless trespassers who want a peek at your pond. Some, however, may decide to vandalize your pond. They may poison the pond (fertilizers, bleach, soaps, etc. ), steal or kill fish, pop liners, destroy plants, etc. This can be very sad and discouraging. Security equipment may be necessary. Even friendly visitors may trip in for an unexpected swim. If you are in a populated area, it would probably be good to fence the pond in so that no one falls in the pond. In some areas, they can sue you even though they were trespassing. Also, if lots of young children are around, fencing may be necessary. Be sure that your visitors and neighbors who can see the pond know to stay off the rocks or edge of the pond and other pond rules you may have. Unless it is your intention (for a business or you are real proud of your work), it is best to situate your pond where as few people passing by or neighbors can see it. Our ponds are well hidden. I have gotten e-mails from people whose ponds were poisoned by disgruntled neighbors and trouble-making neighborhood teenagers. 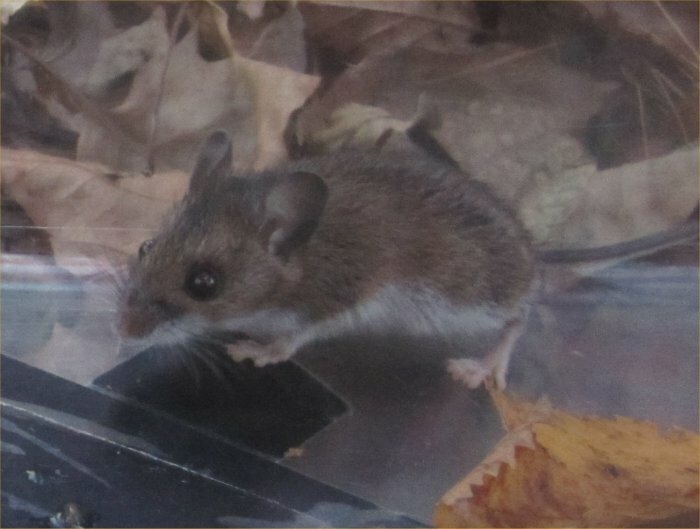 It is fitting that mice come after humans because mice follow humans all over, eating their leftovers. 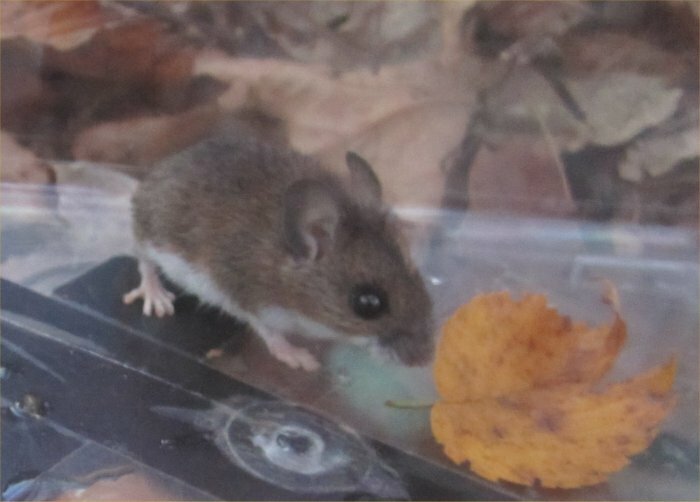 In late 2016, I discovered that there were deer mice in my basement. 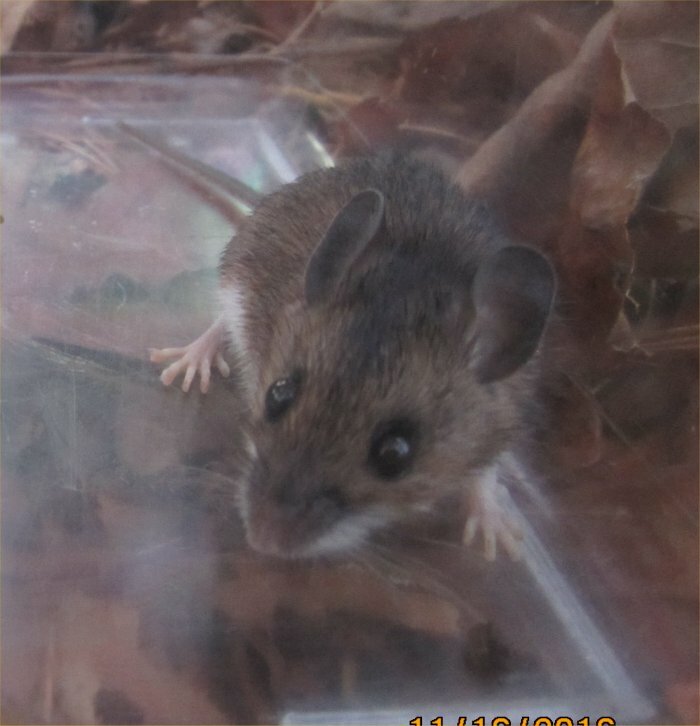 Over about two months, I caught 21 of them in live traps! One was dead for some reason but the other 20 went back to the wild. I took photos. A rare mole will get into a pond. 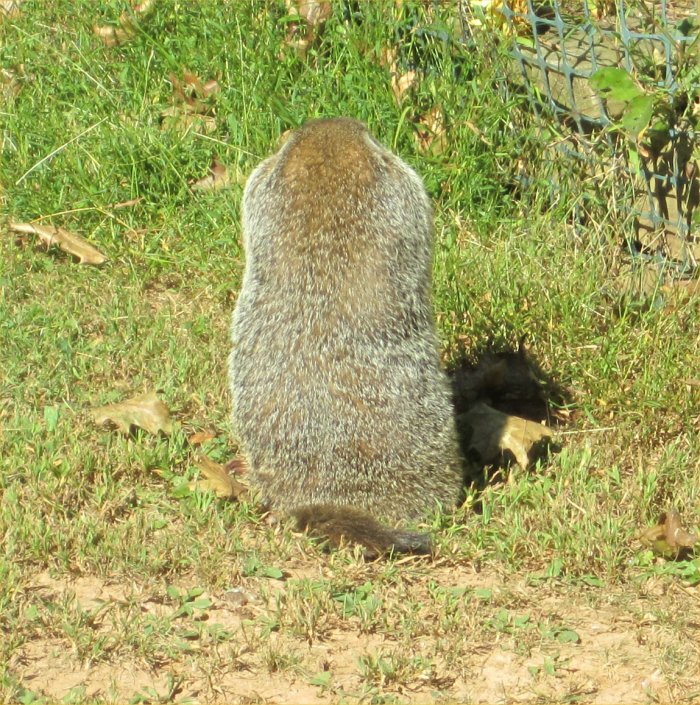 The main concern with moles is that they may burrow into a liner or otherwise displace it. Moles can be trapped with various fatal in-ground traps or by other methods. A sonic mole repellant is available that uses sound to deter them. 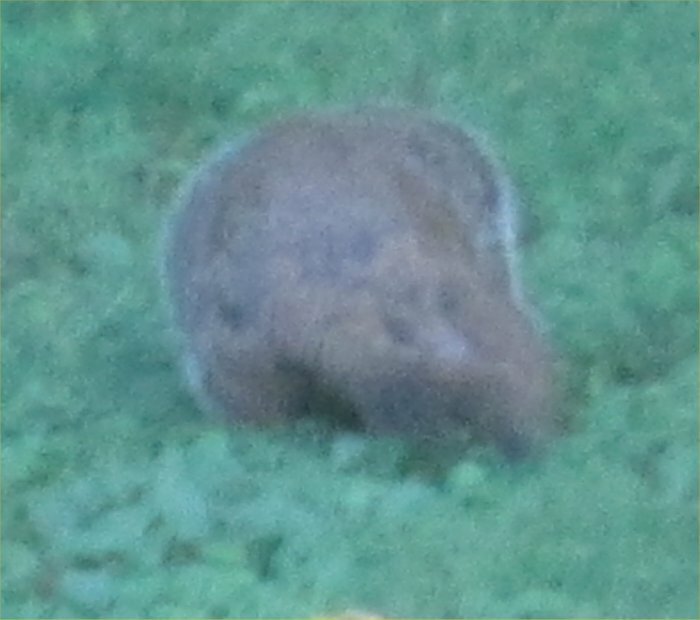 There are a LOT of moles near my ponds as evidenced by raised mole-runs in the mulch and grass all over our property. I have a sonic mole repellant but am afraid to use it near the pond for fear that the noise will also bother the fish. My pond has been set up since 1997 and has yet to show any mole damage. I have heard only one ponder's report of mole damage to a liner in that time. 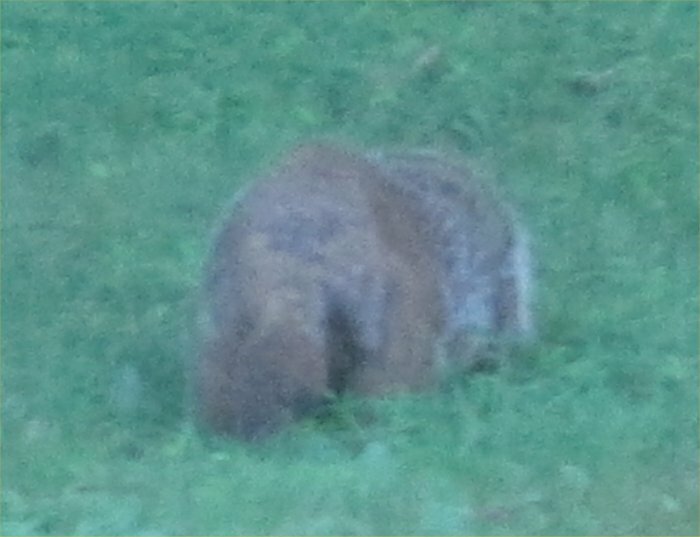 So, moles are rarely a problem unless you trip over their runs, or they eat your favorite bulbs (that eat a lot of ours). 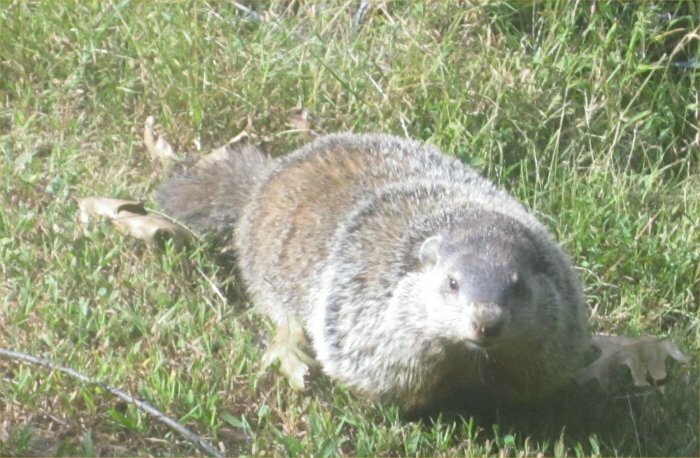 In fact, they are beneficial because they also eat beetle larvae in the ground. We used to have a dog who would hunt moles and kill them. Muskrats are common in wetland areas. 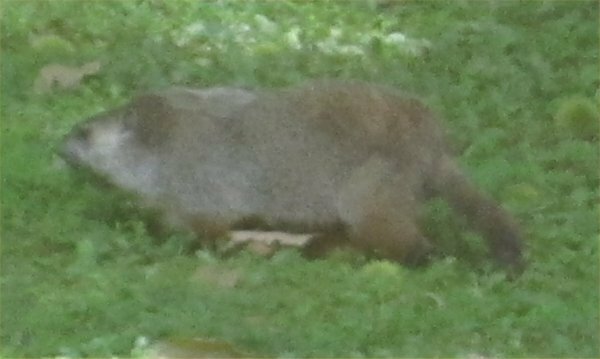 They are similar to small beavers in that they can alter a landscape by eating lots of vegetation and moving things around. Muskrats like to borrow into soft earth around a natural pond. They rarely show up to a lined pond but may come in and eat some plants or even create havoc. 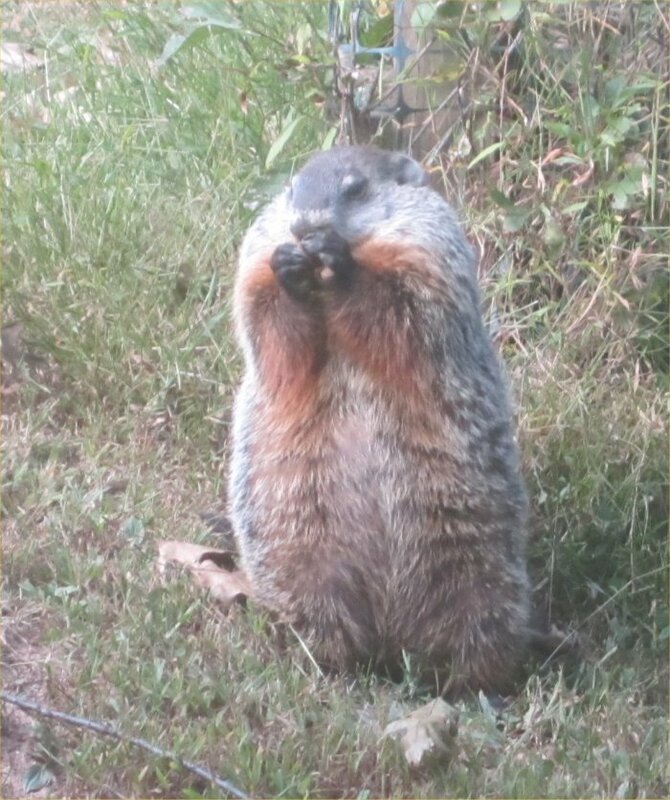 Muskrats are not much bigger than a large guinea pig and are hunted by both natural predators and humans. I have never seen one so I cannot offer first-hand information. 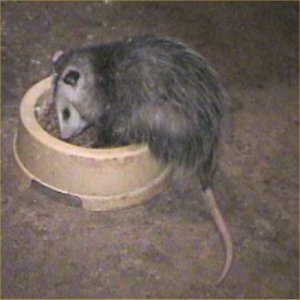 A baby opossum helping himself to some dog food on our back porch on 12/5/03. 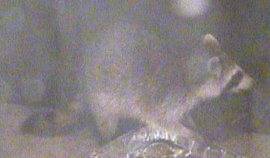 An occasional opossum may decide to try a fishy snack but I have yet to hear a complaint on the newsgroup (rec.ponds) or the internet. As with similar predators, they can be kept from eating fish with fencing, netting over the pond, deep water, a cliff from the ground to the water, and/or lots of hiding plants (mostly plants) for the animals. 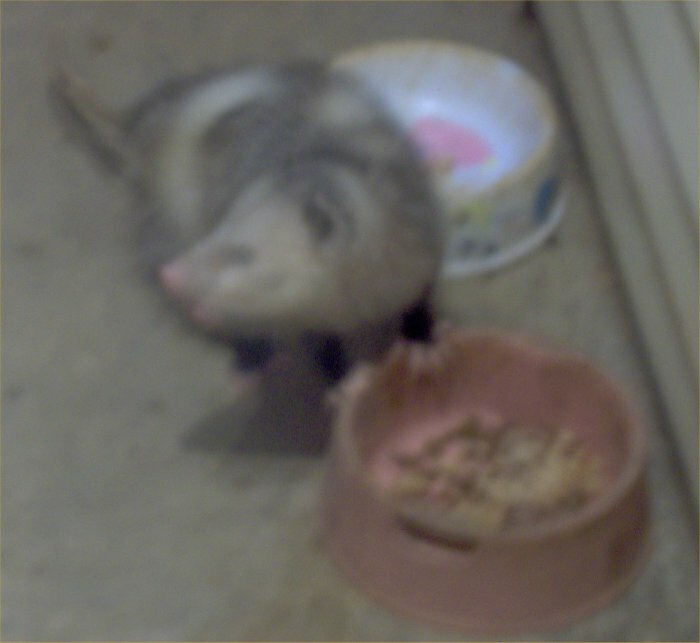 Here is an opossum on the back porch on 1/26/10. 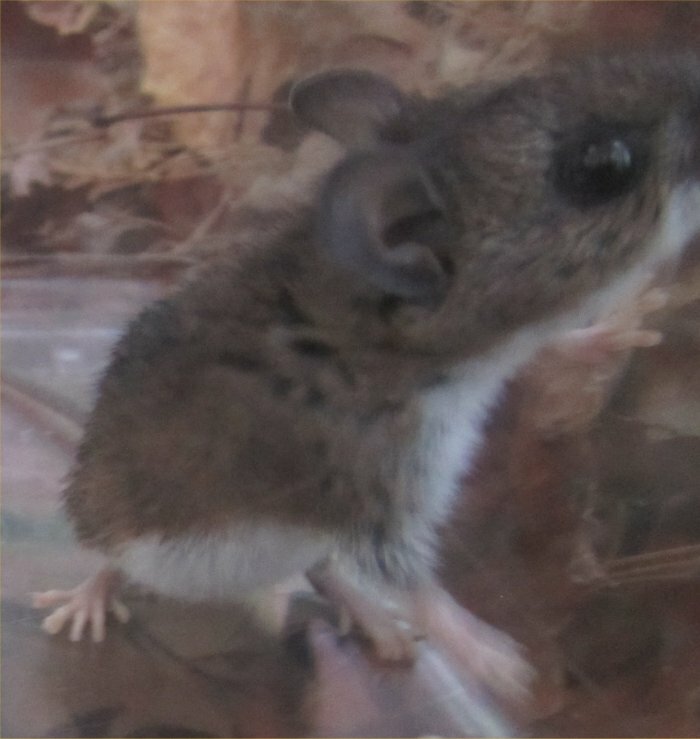 Note the pink tips on his ears and that the tip of his tail seems to be bloody. 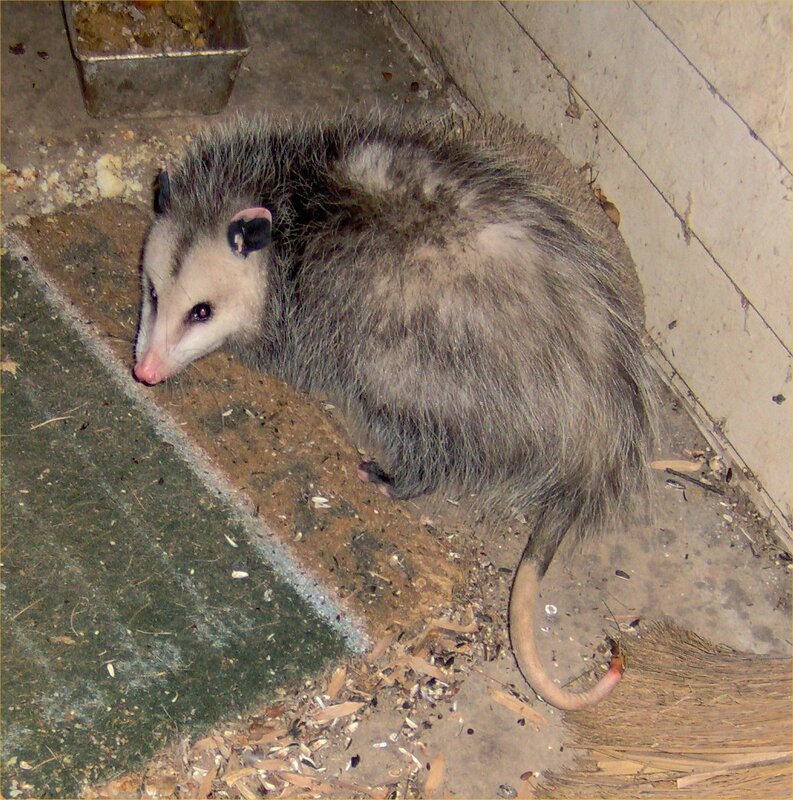 This opossum was probably born in 2009 as he/she was small. The little one hissed at me right after I took the photo! 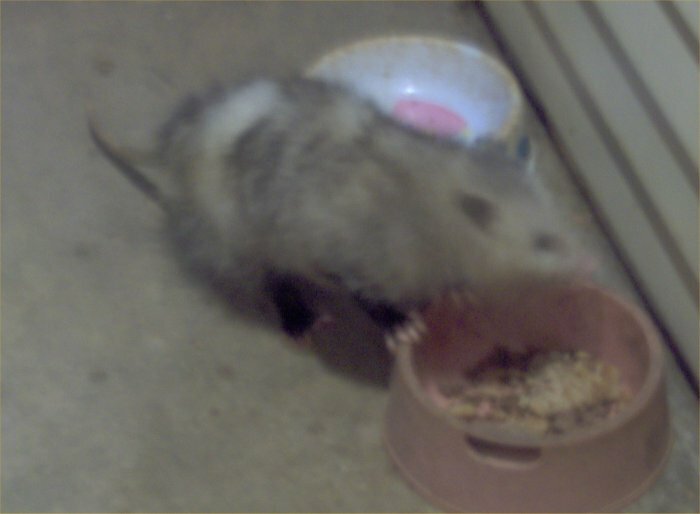 I took these two photos of an opossum on the back porch on 5/20/12. I am sorry that my camera would not focus. Skunks are similar in their habits to raccoons so see above for methods to deter them. The one big difference of course is that they can spray stinky fluids. If a skunk was the one rooting in the pond, its smell should linger in the morning. Skunks can be trapped but it is necessary to be very careful to avoid scaring the animal into spraying. Covering the trap with a towel helps keep the skunk calm. Be prepared for spraying. While I see dead skunks near our home along the road and smell that live skunks have visited the pond, I have never seen a live skunk except in the zoo. I talk about a skunk that dug up a yellow jacket nest by my pond in my October 2007 pond newsletter. Back to the main pond mammals, birds, and reptiles page. Back to the pond index.